Canon 7DII, Sigma 150-600 Sport, F/6.3, 1/500s, ISO 640, 548mm, hand held. The photo indicates the poor conditions effectively! 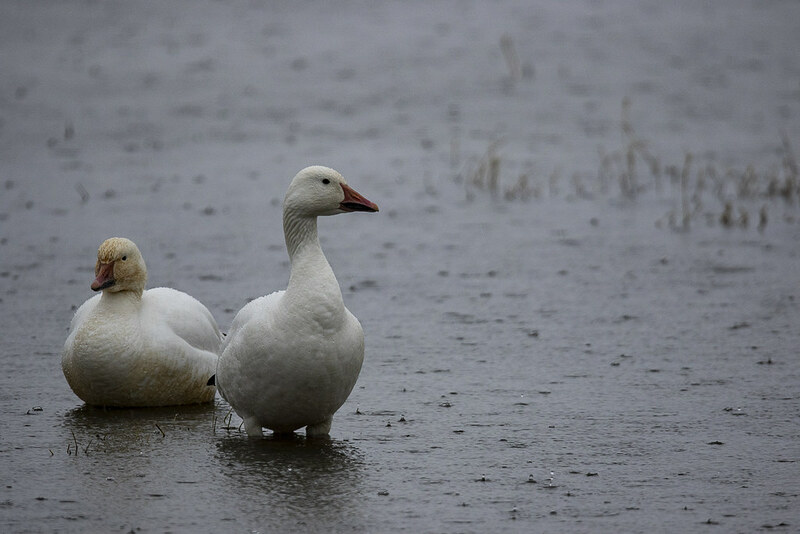 Nevertheless, you have controlled everything well to capture the colour, detail and texture in the geese, with the added bonus of some raindrops bouncing on the water. It seems rather tightly framed on the left hand side but I like the space on the right. As the bird on the left is turned towards the left, perhaps there should be a bit more space for it to look into (about double the amount that is already there on the left). It can be fairly easy with an image like this, Craig. First increase the size of the canvas, e.g. by pasting the image onto a wider rectangle to give some empty space on the left, then copy and paste (or clone) random parts of the water into the space. Some photo software, e.g. Elements, Photoshop, PaintShop Pro, makes this even easier to do with tools called "Canvas Size" and "Content-aware Fill". Looks good to me. Lovely and sharp! Current time: Apr 25, 2019, 22:43 Powered By MyBB, © 2002-2019 MyBB Group.